CI-WATER researchers have developed advanced modeling capabilities so water analysts can better understand how water moves through the Intermountain West. 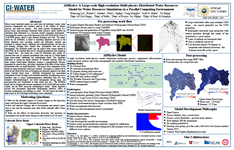 The Watershed Modeling team has produced ADHydro, one of the most robust, high resolution, water modeling systems in the world. The large-scale simulation was developed specifically to enable water professionals to benefit from high-performance computing (HPC) capabilities without having to develop HPC expertise. HPC environments are necessary for ADHydro’s groundbreaking scale and higher resolution. It also includes all processes relevant to water, including precipitation, soil infiltration, evaporation and transpiration, human factors and more. In addition to producing more accurate water forecasts for regional resource managers and researchers, CI-WATER’s models can be adapted for use in other regions. 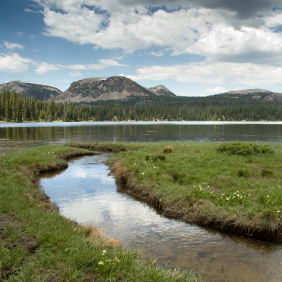 By making HPC resources more accessible, the models leverage technology infrastructure to give water resource managers and researchers new tools for attaining insight. Contact us to learn about ADHydro’s current development status. Presented by Fred Ogden, Robert Steinke, Wencong Lai, Craig Douglas and Nels Frazier at the All Hands Meeting on October 10, 2013 in Salt Lake City, UT. Presented by Robert Steinke at the All Hands Meeting on October 10, 2013 in Salt Lake City, UT. Presented by Wencong Lai at the All Hands Meeting on October 10, 2013 in Salt Lake City, UT. 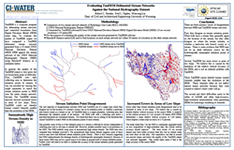 2013, Subsurface Flow Modeling: Upscaling, Inversion, and Model Complexity, Colloquium, Dept. of Civil & Environmental Engineering, Colorado School of Mine, Golden, CO.
2013, Subsurface Flow Modeling: Upscaling, Inversion, and Model Complexity, Brown Bag Seminar, Los Alamos National Laboratory, EES-16, Los Alamos, New Mexico. 2013, A New Direct Method of Parameter Estimation for Steady State Flow in Heterogeneous Aquifers with Unknown Boundary Conditions, MODFLOW and MORE, 2013, Translating Science into Practice, Golden, Colorado. 2013, Simultaneous Inversion of Parameters, Source/Sink Strengths, and Boundary Condition for Confined and Unconfined Aquifers, Analysis and Computational Math Seminar Series, Dept. of Mathematics, University of Wyoming, Laramie, Wyoming. 2012, New Direct Method for Aquifer Inversion with Unknown Boundary Conditions, GSA Annual Meeting, Charlotte, North Carolina.